Ho Lee Fuk. What’s up? Wi Tu Lo. Our scores need to go up. The US spends more $15,000 per student annually. This is more per student than any other country. OECD. And here’s what we get for our money . . .
How is it that something like this can make national news in America? Did you know that the US has been slipping behind in the global report card for years? Even smart people who work at places like news agencies can be duped by an intern or Dum Gai. According to the OECD, the US falls well below the global average for the percentage of students graduating from high school. The NO Child Left Behind policy obviously doesn’t apply to ALL children. If you want to increase your child’s chance of graduating from high school, you’re better off in Slovenia, Finland, Japan, Korea, the UK, or more than a dozen other countries that outperform the US. But if you have the money, you can move to an upscale suburban neighborhood where higher property taxes help to ensure that your child gets a better than average education. Watch Waiting for ‘Superman’ to see if you have enough money to play education roulette with your kid’s future. I don’t cry easily, but this film had me sobbing over the fact that American leaders are neglecting the education of millions of children, instead choosing to imprison them as young adults, causing them to fall into a life of poverty where they scrape by in less than desirable neighborhoods. And become a financial burden to all Americans. The wrong people are going to jail in this case! Go KIPPsters! Apparently some children are more important than others. Do you believe everything you hear on the evening news? I don’t either and I urge you to start looking for second and third opinions elsewhere. And teach your kids to do the same. If you and your kids can get news in other languages, all the better. Languages act like firewalls. If you can’t speak a language, you miss out on a lot of information on the other side of the wall. Big corporations buy out news organizations, politicians and scientists to ensure that we only hear what they want us to hear. And they pay off citizens to keep their mouths shut. Smart people with ethics don’t last long under these circumstances. They eventually lose something: their ethics, conscious, job, home, health or life. The Union of Concerned Scientists represent 400,000 scientists and citizens from all walks of life who believe that we should be making decisions based on science without obstructions from politics, the media or corporations. UCS is working on some of the world’s most daunting problems such as global warming, how to feed, power and transport the world’s growing population, and how to reduce the threat of catastrophic war. Watch Collapse to get an idea of how we got where we are and for tips on what you can do to help prepare for the future. Survival of the fittest applies to both animals and people. The country with the smartest and healthiest people has the best chance of surviving. According to the OECD, Asian students make up 53% of foreign students enrolled in universities worldwide. The largest numbers of foreign students are from China, India and Korea, and these numbers continue to grow. 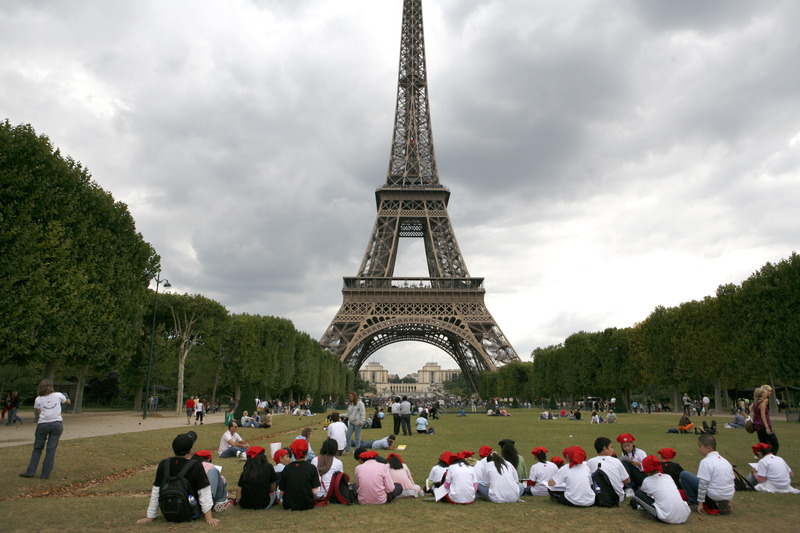 Europe is the top destination for students enrolled in college outside their country of origin. Although foreigners are still enrolling in American universities, it’s on a downward trend. Wonder why? Talk to Wi Tu Lo and Wi Tu Phat. An American man struck up a conversation with a woman from Switzerland while on a Mediterranean cruise. They seemed to be hitting it off fairly well so he invited her to go for a dip in the sea followed by dinner when they docked in Rome. “Can you speak Italian?” she asked. “I’m American. I only speak English,” he responded. “Can you swim?” he asked. If you want your children or grandchildren to have a better understanding of the world, encourage them to travel and study abroad. There are so many things they’ll never see or comprehend if they never leave the country or learn another language. You can’t see your country when you’re too busy driving between your home in the suburbs to your job, to strip malls scattered all over the place and to gas stations to keep filling up your tank. And the growing number of less fortunate who don’t have a car or home, are too busy trying to figure out how they can safely eat and sleep each day. Have you found your Escape from Suburbia yet? Every good artist knows that you have to step back and look at your creation from a distance. Only then do you gain a true perspective on the whole. This is when you gain new insights and come up with innovative ideas. That’s what a democracy is about, right? Education for all and freedom of speech for all. We educate our people so they have a fair shot at the American dream and a say in shaping our country, making it a better place for everyone. You don’t have to wait until your kids or grandkids are in college. Students can participate in exchange programs in middle school or high school. When I was living in Shenzhen, China, I had the opportunity to befriend and become language partners with Yang Mei Hong, the founder of Yang Mythos, of one of the most amazing intercultural schools I’ve ever seen. 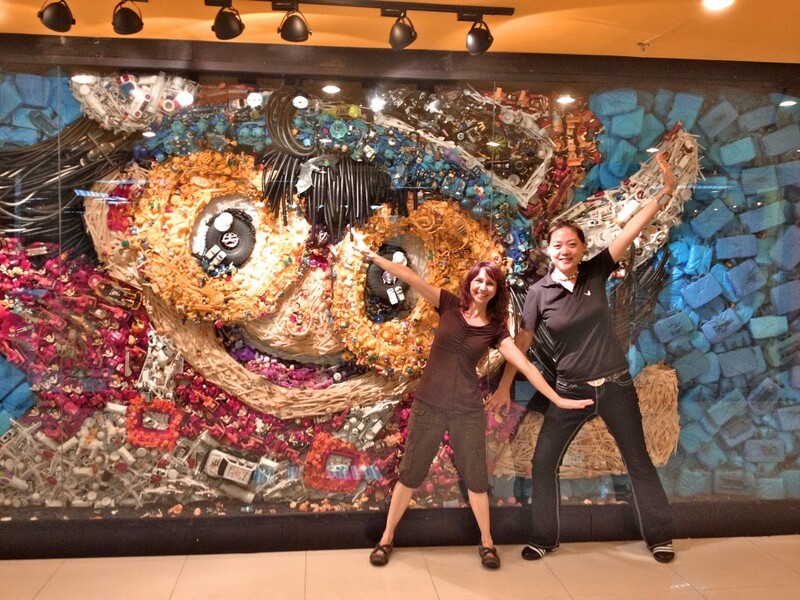 Yang Mythos Art Education Center isn’t only about art, fashion, dance and travel. It’s so much more. Students have the opportunity to attend local art classes with many talented foreign, bicultural or bilingual teachers as well as participate in international exchange programs. These real-life experiential programs give them hands-on opportunities to practice creativity, happiness, wisdom, enlightenment, and much more. The teachers, parents and students all have fun while building relationships and bridges among people and across cultures. Yang Mythos has more than a dozen exchange centers throughout the world, in China, Hong Kong, Japan, Korea, Canada, France and Germany. And they just recently opened a new center in Washington, DC. 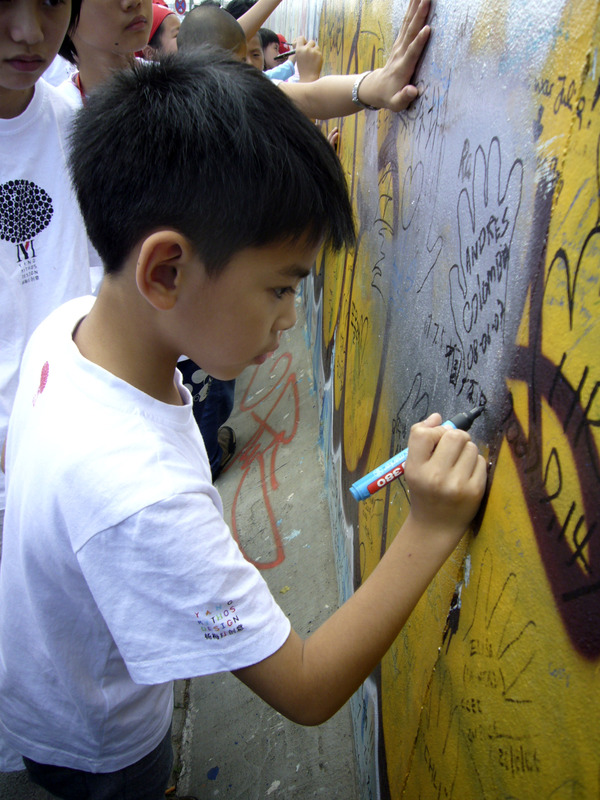 This Chinese boy is writing on the Berlin Wall. Who knows how this experience might affect his future? Perhaps he will tear down Nefarious walls and free people. The writing is on the wall. “What do you want to be when you grow up?” asked the teacher. “What do you mean by that?” the teacher asked. Don’t let money stop you. Look for funding through organizations like the Institute of International Education. Just one international trip can change many lives forever. Take a look at the Touch A Life Foundation to see what one trip to Vietnam did for Pam and Randy Cope and the countless lives they’ve affected through this organization they founded. When was the last time you told your kid to go away?